Balance Bar Prize Pack Giveaway! Fine Print: I was given a prize pack and Balance Bar is giving another to a reader. All opinions and statements below are my own. Take your workout outside. Outdoor workouts are challenging and refreshing so try paddle boarding, surfing, cycling, yoga in the park or group runs like a 5K. Eat seasonal fruits and veggies. Most fruits and veggies are at their peak during summer months and by eating them you’re adding more nutrients to your diet. Look to add a host of different colors to your meal with various fruits and vegetables. Try grilling vegetables (corn, eggplant or zucchini) for a delicious side to your dinner or add juicy fruits (blackberries, peaches and melon) to your morning breakfast. Drink more “fun” water! It’s important to drink a plenty of water especially in the summer when you’re more prone to dehydration. I like to make infused water mocktails to make water more exciting and delicious and only adding 20 calories or less. Buy some fresh fruits, slice them up and add to your water. My favorite combinations are peaches and strawberries, strawberries and mint or cucumber and watermelon and you’ll want to drink it all day in fun infusers. Eat many small meals. When you eat smaller portions more frequently, your metabolic rate tends to be higher (meaning you can burn calories more easily). 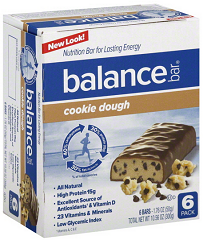 I always tell my clients to eat 5-6 small meals a day that are packed with nutrients, including a snack in between each meal with something like a Cookie Dough Balance Bar® which will keep you full longer and help satisfy your appetite. Balance Bar® is also a great snack to put in your purse or gym bag so you always have a nutritious snack on-hand and can avoid making those bad snack choices at that last minute and when on the go. I recently got to try both the Peanut Butter and Cookie Dough flavors, neither of which I’d tried before. I LOVE the Peanut Butter variety. Granted, there is the undertone of the protein bar flavor that most of us are familiar with, but it is very Peanut Buttery and has the consistency of the inside of a Milky Way bar. I would totally keep these in my car or purse as a snack. The Cookie Dough variety is very sweet. My daughter was a huge fan, but it’s a bit too sweet for me. This has a similar consistency to the Peanut Butter, but has little chocolate chips inside that provide a bit of crunch. It does smell and taste like cookie dough and you will probably enjoy it if you are a fan of the sweeter protein bars. To keep up to date on everything Balance Bar, follow Balance Bar on Facebook, Pinterest and Twitter and be sure to be available for the Balance Bar Twitter chat on July 31st at 3PM! To get everyone excited about shaping-up in celebration of summer, I am giving one lucky winner a Balance Bar Prize Pack including a variety of Balance Bars, a Ball Jar + Ball Wide Mouth Jar Infuser (perfect for fresh lemon/mint/cucumber/etc. water during your workout!) and a Balance Bar branded swag item! To enter this giveaway, complete any or all of the options listed below. Giveaway ends 7/25. Good luck! *Note – if you are reading this by email, RSS or any other platform that doesn’t show you a widget above, click through to the post and you will see it. We swim a lot in the summer, and spend a lot more time outdoors. I try to watch what I eat. I also love to swim. I replace a meal a day with an energy bar. I would so love to win this and continue working toward a healthy lifestyle this summer! Drink more water and take more walks. I like to take walks in the evening. I love to walk our dogs at the part. I do HIIT workouts. Thank you for the wonderful giveaway. I don’t do too much. I just try and watch what I eat. I get exercise by gardening which includes sticker removal. I am going to take a yoga class soon to keep everything stretched out. I am moving which is going to take forever and packing, lifting and cleaning as I go. Walking everyday and playing with the kids everyday outside! Gardening and yard work shapes me up for the summer. We swim alot and eat more fruits and vegetables, it really shapes us up! I change up my workout routine adding more weight training and less running. I do my daily walking. I go to yoga 3 times a week and go for a walk everyday. I go to the gym year round to stay in shape. I drink lots and lots of water. But sometimes, it gets boring, so I have been wanting to try diffused waters! I really don’t exercise Like I should but I do try to walk around the neighborhood as much as possible. I exercise and eat more salads and lots of water. I’ve changed my diet drastically and have only eaten protein fruits and vegetables-no carbs no bread no sweets. I also run/sprint walk in the morning and then do Zumba or Yoga stretch in the evening. Lost over 30 lbs that has been on me for decades. I just keep walking and using my free weights and eating properly. I just try to get outside more and be more active. I start walking more when the weather begins to warm up. I have a 1.5 yr old, so chasing him around is QUITE the workout! I lift weights to keep strong. I would love to win these to supplement for meals. I go for walks and hikes at the parks around my house. Cut back on sugar and start walking mostly. I go for walks during the hott summer days. I get on the treadmill a lot more than normal. I start going for daily walks and try to push myself a little further every day! I need to work on that. I do walk lots though. I have a balance bar every day of the week and it makes a big difference in my energy level. I try to wake up a half hour earlier so that I can run. I have been walking and drinking water and eating healthier. I get back to the gym and workout after a long cold winter at home. I try to get outside and walk more. I do Focus T25 and also walk and swim. I started watching my portions to cut down on calories and walking in the evenings at the local track. We do a lot of walking! I do a lot of walking. One thing I do to start shaping up for summer is sit ups. I bump up my running and do it in the evening and morning as well as watching my diet more. I try to be more active in the summer. We do a lot. Honestly, I have never been a big fitness person. This Jan. I had my son, so when I was able to I started going to classes, and I dropped all the weight really fast! I plan ahead of time what type of spring cleaning and random projects I want to get done before the warm weather. My inspiration is not having to worry about them when it gets too hot and therefore can spend more time outdoors. It helps get me in shape because I tackle everything I can think of. I start doing sit ups to get in shape for summer. I take a morning walk. Thanks for the giveaway…we swim laps 3x a week year round, walk, run, etc.